Liftmaster Craftsman photo eye safety beam sensor kit 41A4373A. NO LONGER AVAILABLE. 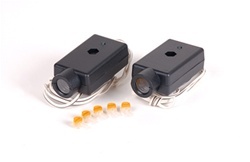 SEE DIGI-CODE CR2149A UNIVERSAL GARAGE DOOR OPENER SAFETY BEAM SENSORS FOR REPLACEMENT. Product was as stated; worked GREAT! Thanks for making this an easy repair. Very happy! It came fast. The Man that took my order was very help- full I will be ordering more parts soon. Thank you.